TT-200-96SC 96-Well Sample Concentrator is intended to provide rapid evaporation of solvents from samples in 96-well PCR plate, 96-well microplate or up to 96 x 0.2ml microtubes in a single batch. It works under the principle of solvent evaporation to concentrate samples. By heating the samples/solution in a dry block heater coupled with a stream of inert gas (nitrogen) direct to the surface of the sample, vapour is rapidly driven off and the sample is quickly concentrated. 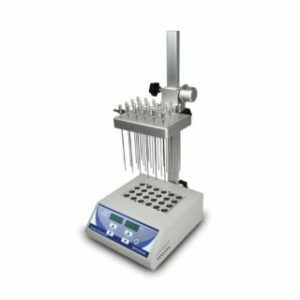 The sample concentrator is built with gas chamber with 96 gas needles mounted onto a height adjustable stand which allows flexible positioning above the samples. 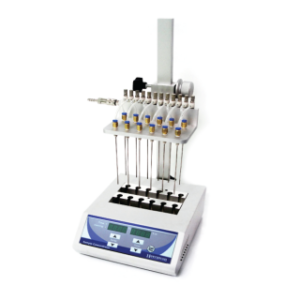 It is a compact device commonly used to replace high cost rotary evaporators and safe to be used in fume hood. Optional flow regulating valve to minimize wastage of nitrogen gas.